“Your call is crucial to us.” This is the first line a customer listens when calling into a company. But the irony is that this is heard after listening to automated response for about 2 minutes. The ever growing urge for not missing any business call results in robots answering the calls instead of human beings. This is often frustrating for a customer to hear a robotic voice and wait to get his issue resolved. And obviously these customers won’t like getting lost in endless menu calls. With business calls being indeed crucial for companies, the journey of finding ideal service solution is always difficult. Although you may think that you know your customers well but there can be pool of myths still abound. Myth Busted: You as a business owner may feel that most customers call into a company when they encounter some problem. But the truth is less than 25% of customers complain when they have an issue. Companies often spend large capital in providing customers with avenues to complain but 90% of customers don’t bother to use them. Instead they tell other consumers two-three bad things about business. Hence, it is crucial to address their issues. Myth Busted: You don’t need to give your customers cash-refunds or compensations after their complaint calls. 80% of customer complaints are no-brainers and can be addressed with a clear explanation. It is crucial to get more customers complaining and getting their issues resolved instead of losing business or giving them compensations. Myth Busted: You may be mistaken that you are delivering exceptional services to customers if you are not getting enough customer calls. Fewer calls can mean a large pool of unhappy users. Your customers may give you an opportunity to put things on track and if you’re not doing so then you may be losing out your business. Hence, make sure to interact with customers often to know about your weaknesses and get suggestions to improve. Myth Busted: It costs around 5 times more than normal to find new customers than to retain existing ones. 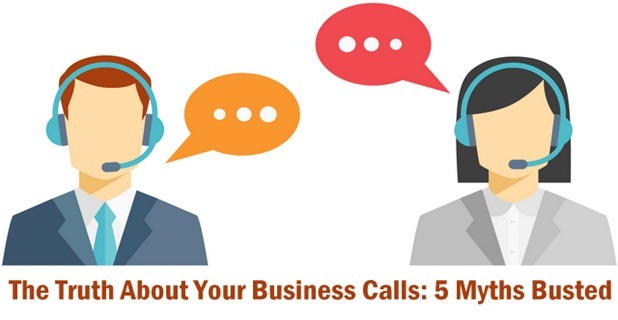 Hence, you as a business owner must keep looking for ways to improve the handling of business calls and making sure your customers are satisfied with response from the company. You customers may go insane with long waiting and long menus. So it is crucial to look for ways so that they can get connected to agents soon in spite of wasting capital in marketing & advertising. Myth Busted: Most companies consider customer calls as a way to improve. It is said that return-on-investment for every customer call taken and resolved is 100%. Hence, customer calls must be taken as way to strengthen weak areas and put best efforts to resolve them. These are the common myths that you may have overlooked for long. Your business may be competent to spend millions on good customer service but knowing these little things can enable you to handle and resolve customer complaints effectively. By avoiding these common myths, your business can hit the bull’s eye for sure!